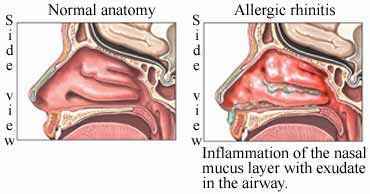 Allergic rhinitis is caused by the inflammation of the nasal passages. It is usually associated with itching of the nose and the eyes as well as watery nasal discharge. Its symptoms occur after prolonged exposure to danders, dust and even seasonal pollens. Different kinds of seasonal allergens and perennials can cause allergic rhinitis. These allergens include cockroaches, molds, dust mites, and animal dander, which are considered as year-round allergens. Ragweed pollens, trees and grass can also trigger allergic rhinitis. Seasonal pollens can also cause rhinitis when they are carried in the wind for cross-pollination. Plants such as dandelions and goldenrods are usually associated with allergic rhinitis because they depend on insect pollination. Animal allergens, also known as indoor allergens, are also common causes of allergic rhinitis. The small, light protein animal skin can stay suspended in the air for up to six hours. Hence, even after animals are removed from the environment, the allergens they bring can still linger for several months. The most common symptoms of rhinitis include persistent sneezing, congested and itchy nose and watery discharge from the nose. Sometimes, it also causes other symptoms such as loss of smell, pain in the face, red eyes, headaches, and even an itchy throat. Sometimes, post-nasal drip and chronic cough also appear during periods of allergic rhinitis. Ear plugging associated with sinus headaches is also a common symptom. Episodes of allergic rhinitis can be prevented simply by avoiding seasonal allergens and indoor allergens. Exposure to outdoor allergens can be decreased by closing all the windows in the home and turning air conditioners on. Prolonged exposure to outdoor molds can also be prevented by avoiding activities such as mowing the lawn and other activities that might expose patients to outdoor molds. Lastly, allergic rhinitis can also be prevented by using air purifiers and filters in the house. This can decrease the amount of allergens and dust clinging to mattresses, pillows, carpets, and other animal products. They can also balance the air and make sure that it is clean and free from harmful toxins and substances. There are different treatments used for curing allergic rhinitis. Their goal is to reduce the allergy symptoms by encouraging patients to avoid allergens that trigger rhinitis. Quick relief from this allergic reaction can be experienced with the use of some effective home remedies. Antihistamines and oral decongestants are very helpful for reducing the symptoms of rhinitis. They are usually available in tablets, liquids and capsules. They work by decreasing the sudden increase of histamines and mediators in your body. Nasal sprays are also common home remedies for allergic rhinitis. They can be purchased over the counter and they work well with supplementary decongestants and antihistamines. Nasal sprays work by allowing nasal mucus to leave your nose; hence, decreasing the inflammation in the nose’s sensitive tissue lining. Water therapy is also an effective way to cure allergic rhinitis. By inhaling the steam coming from boiling water and drinking more than eight glasses of water a day, quick and long-lasting relief from allergic rhinitis can be experienced.